St Peter’s Seminary in Cardross – better off ruined? The human race is, and always has been, ruin-minded,’ wrote Rose Macaulay in Pleasure of Ruins (1953). Ruins can evoke feelings of awe, of melancholy, of outrage. The English have long taken pleasure in the picturesque ivy-clad ruins of the monastic buildings despoiled by Henry VIII, while ruined temples continue to impress by evoking the grandeur of past civilisations, Greece and Rome. Ruins forcibly remind us of the ephemerality of all human achievement. Time, nature and ‘pleasing decay’ can mitigate the essentially scandalous nature of ruins created by fire, war and vandalism. If the outrage is recent, the ruin is more raw and its emotional impact greater. In the 1920s, Auguste Perret, the great French master of reinforced concrete, argued that ‘the maimed cathedral’ at Reims, pulverised by German shells during the First World War, should not have been restored: ‘The traces of War should not have been erased; the memory fades only too quickly.’ During the next war there was a move to preserve certain buildings, gutted by bombs, as war memorials. The noble ruin of the Church of St John the Evangelist in Red Lion Square, the vaulted masterpiece of J.L. Pearson, was recommended for this purpose. 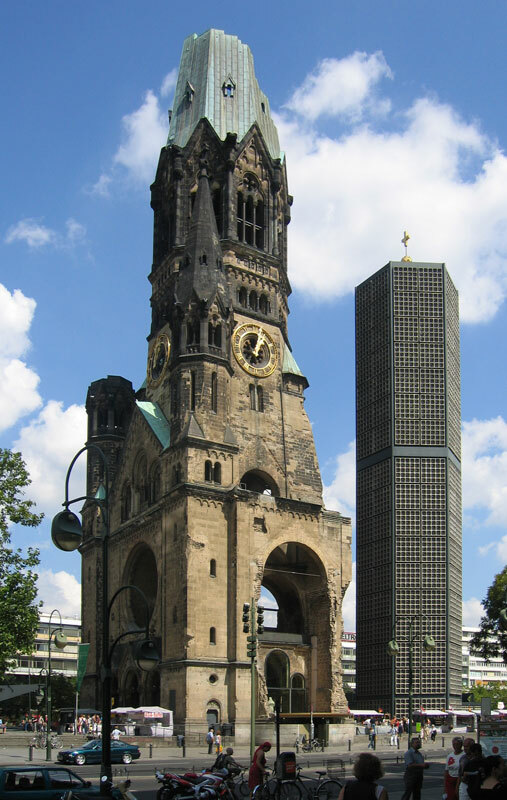 But property values soon prevented London having the equivalent of the partly ruined, partly new Kaiser-Wilhelm-Gedächtniskirche in Berlin. 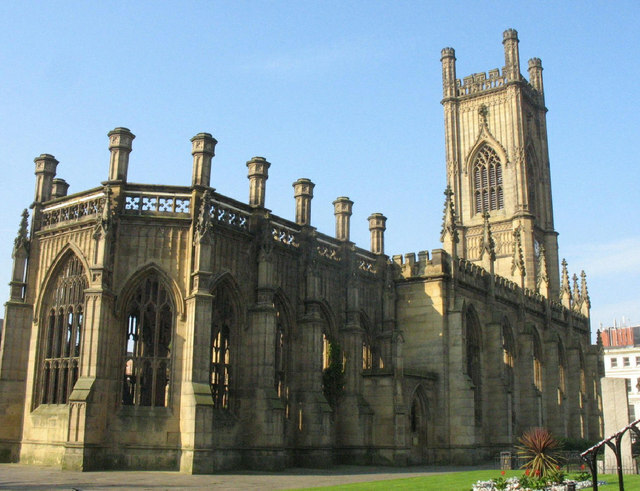 In Liverpool, however, the gutted shell of St Luke’s Church, a magnificent example of Regency perpendicular gothic by John Foster, escaped demolition and today is regarded as a war memorial. But this fine ruin also demonstrates the problem with such things: ruins need to be preserved if they are not to be further ruined, for they are vulnerable. Walls exposed to the weather on both sides soon begin to crumble, and in the case of St Luke’s, £500,000 is now needed to repair the decaying stonework. In truth, a more economical and practical solution would be to put a roof back on. Sometimes the best thing to do with a ruin is to rebuild it. Some buildings make better ruins than others. Classical architects liked to think their own buildings would make ruins as fine as those of Greece and Rome – which is why Soane commissioned J.M. Gandy to paint his cut-away bird’s-eye perspective of the Bank of England as if it were in ruins. Similarly, a century or so later, Albert Speer ‘had a romantic drawing prepared’ to show what his Zeppelinfeld at Nuremberg ‘would look like after generations of neglect, overgrown with ivy, its columns fallen, the walls crumbling here and there, but the outlines still clearly recognisable’. This was to demonstrate to Hitler his ‘Theory of Ruin Value’ and the idea ‘that buildings of modern construction were poorly suited to form that “bridge of tradition” to future generations…’ So reinforced concrete, with its rusting steel reinforcing bars, was to be avoided. Yet even concrete structures can make powerful and evocative ruins. In his essay on ‘Pleasing Decay’, John Piper argued that ‘there is no building, whether built with an eye to beauty or no, that does not develop some unexpected charm with age…it is probably impossible to build so as entirely to avoid the ultimate effects of pleasing decay’. That was written in 1947, and since then many modern structures have become ruinous. Sometimes the concrete just looks squalid, especially in the British climate, but abandoned wartime structures, bunkers and pillboxes (not to speak of the remains of Hitler’s Atlantic Wall), as well as industrial structures, can achieve a powerful, if often sinister, beauty. And sometimes the only thing to do with a massive redundant structure of reinforced concrete is to leave it to rot, as such things can be too expensive to demolish. 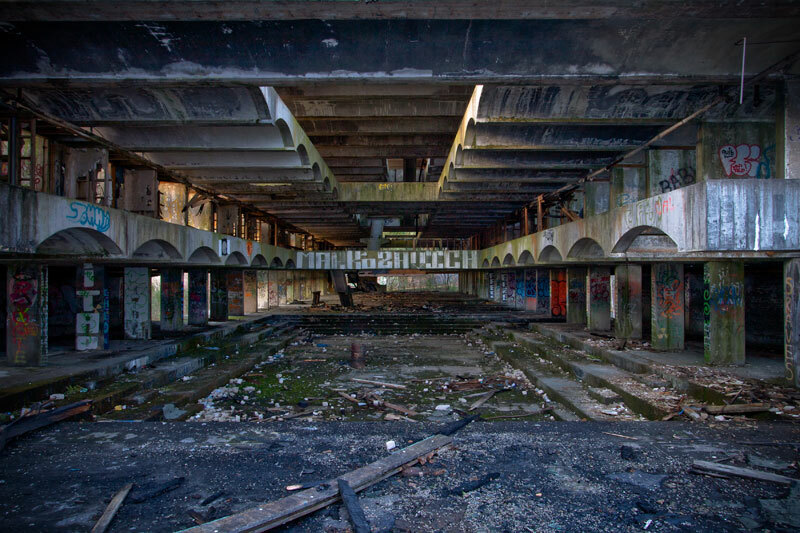 Which brings me to the Roman Catholic seminary dedicated to St Peter at Cardross, a stripped-out, vandalised, abandoned structure that is nevertheless now listed at Grade A – the highest category. It is one of two significant modern ruins in Scotland (the other being the gutted shell of Alexander ‘Greek’ Thomson’s Caledonia Road Church in Glasgow). St Peter’s, closed by the Archdiocese of Glasgow in 1987, is to be found in the middle of a wood on an estate near Dumbarton on the Clyde. For the last quarter-century, increasing numbers of architectural students and architects have stumbled through the undergrowth and squeezed through the security railings to see what is widely regarded as the finest modern building in Scotland despite years of neglect. Its story is peculiarly instructive, for a building that was an undoubted failure, hated by its owner, has become not just a poignant ruin but a compelling architectural monument. Next year, Scotland’s Festival of Architecture will open with a party at Cardross, ‘inviting the public to experience Gillespie, Kidd & Coia’s ruin with sound and light installations for the very first time’. This ambitious new seminary was begun in 1960 and opened in 1966. It was designed by the charismatic pair who changed the direction of the Glasgow firm run by Jack Coia, the late Andy MacMillan and the late Isi Metzstein. Inevitably, both were strongly influenced by the work of Le Corbusier but they managed to create a distinctive, innovative modernism, expressed principally through a series of Catholic churches, which was also informed by a deep interest in Scottish architectural history. Their new buildings at Cardross were disposed around a Victorian baronial mansion, Kilmahew House, by the elder John Burnet. The long residential block was governed by a remarkable stepped section, which allowed internal balcony corridors to look down on the refectory and chapel below – a continuous space divided by a glazed wall; the classroom block was dramatically cantilevered out over falling ground. Like ruined temples and abbeys, Cardross – despite its stylistic modernity – is a relic of a lost civilisation. It was conceived when Catholicism in the West of Scotland was flourishing, but by the time it was finished the Second Vatican Council had rendered it redundant. Priests were no longer to be trained far away from the community, nor were the many side chapels any longer required. It was this, rather than the material problems with leaks and heating, that led the Archdiocese eventually to abandon, and try to demolish it. Metzstein, who could not bear to revisit the site, later commented that, ‘I can certainly say that if they try to pull it down, I’ll have the last laugh: the building would be almost as difficult to demolish as it was to build!’ There have been many attempts to restore and find a new use for the buildings, but all in vain. 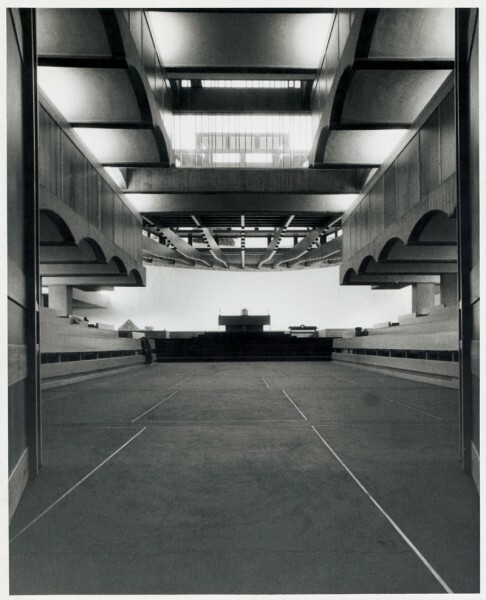 The latest, which looks promising, is Angus Farquhar’s project to turn them into an ‘international venue for public art and knowledge exchange’, using Avanti Architects – with their long experience of restoring decaying Modern Movement masterpieces – to carry out stabilisation and partial restitution. At the end of her book, Macaulay concluded that ‘we get to agree with St Thomas Aquinas, that quae enim diminuta sunt, hoc ipso turpia sunt, and to feel that, in beauty, wholeness is all’. St Peter’s Cardross cannot be fully restored, especially as Kilmahew House, the fulcrum of the whole composition, has gone – demolished after a convenient fire in 1995. So better, perhaps, to leave it in a state in which the imaginative brilliance of its structure and spatial arrangements can still be appreciated, a magnificent modern ruin to rank with Melrose, Jedburgh and Kelso.